This is used to scale the partitions. It is only necessary in the final child data, since each parent partition is scaled to be the sum of its childrens’ sizes. Final child data looks like this. In this case the size represents the population of the given state. The default colors for child and parent partitions are set through style options in the chart parameters, but in this case I wanted to use a color ramp to visualize the median income of each state. I used the Color ramp library to calculate appropriate coloring for each state, using various shades of green as defined by the “greendollar” entry. Here’s an example formula for calculating the color. 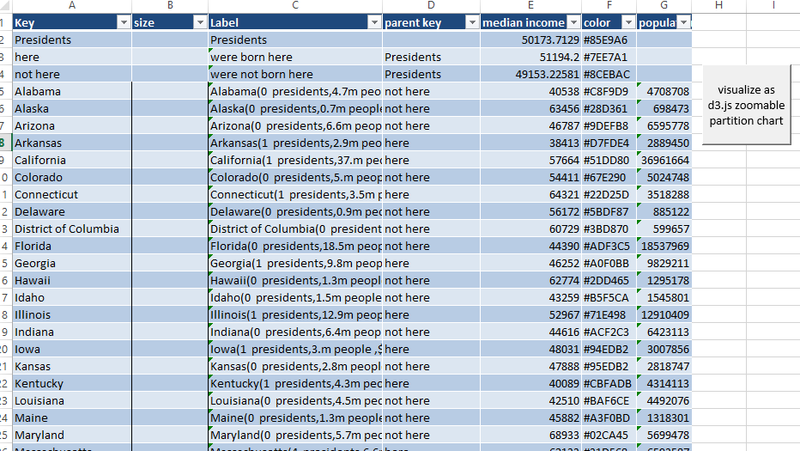 You can download the example in the cdataset.xlsm workbook from the excel liberation site. The test data is in the d3zoompart worksheet and the options can be set in the d3treeparameters worksheet.